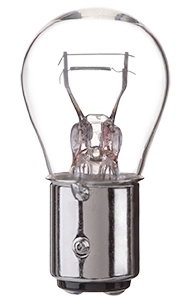 #88929943 GM (General Motors) Replacement Bulb - 12.8/14.0 Volt 2.1/0.48 Amp 26.88/6.72 Watt S-8, 32/2 MSCP, Double Contact (DC) Index Bayonet (BaY15d) Base, C-6/C-6 Filament Design. 2,400/10,000 Average Rated Hours. 2.0" (50.8mm) Maximum Overall Length (M.O.L. ), 0.98" (25mm) Maximum Outer Diameter (M.O.D.). 1.25" (31.8mm) Light Center Length (L.C.L.). All lamps listed are compatible brand bulbs. We do not sell GM brand lamps. All GM brand names, trademarks and logos are property of GM.